Behringer has been on a juggernaut of late. Most people know they build their stuff in China. What most don’t know is that they have their own city there, and everything the build is in their own factories. They are investing $50 Million in a new R&D and manufacturing campus in China. Uli Behringer went there to live for a while just to understand how they work. To some extent, I think Behringer is kind of like a mob family trying to go legit. 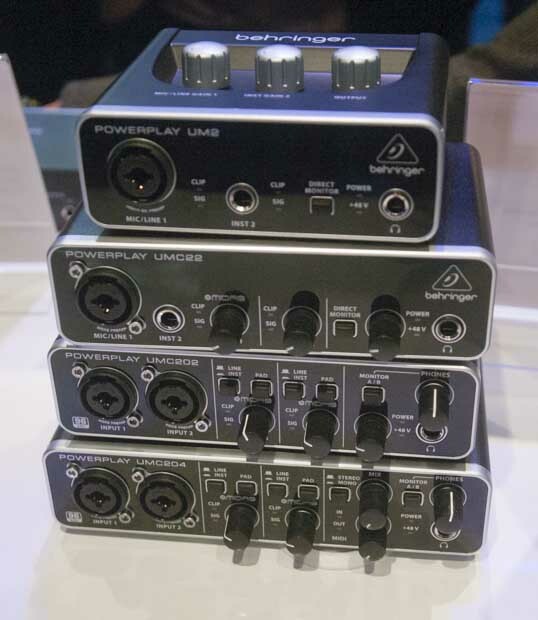 At NAMM this year, they introduced a bunch of new stuff; 28 products at their press event. We’ve already covered the extensions to the X32 line in video, so we’ll skip that here. First up, USB 2.0 audio interfaces. I’ll skip the UM2 because it doesn’t have much relevance to what we do. The first one to look at is the UMC22. It’s a 2x2 interface with a single MIDAS preamp and a line input. Two TRS line outs on the back round out I/O. It samples at up to 48KHz, and offers phantom power and zero-latency direct monitoring. It’s $79. I know. Next up is the UMC 202 which offers two MIDAS preamps as combo jacks for either mic or line inputs plus two TRS outputs. Offering sampling rates up to 96KHz, it also includes zero-latency monitoring as well as clip lights for monitoring signal level. I believe they said the price would be $129. The UMC204 ups the ante a little bit more. Featuring two MIDAS preamps (again as combo jacks) and four outputs (two TRS, four RCA) plus a pair of TRS inserts and MIDI. Again samples up to 96KHz, with a price of $149. These may not be ground-breaking, but to get a pair of MIDAS pre’s in a USB 2.0 interface for under $150 is pretty amazing. I would seriously consider the UMC202 as a portable measurement interface. Need an interface for your iPad? Check out the iStudio is202. As it’s name implies, it includes 2 mic/line combo jacks (they don’t mention MIDAS, so I would assume they are not), and will output to either the TRS or RCA jacks. It includes two foot switch inputs plus MIDI I/O. They even include composite video out on an RCA. Right now, it’s 30-pin only, but a Lightning model is coming soon. It can also be battery powered for a completely portable solution. And the price? $149. This is the update the the “beloved” (their words) ADA8000 interface. If you have a Yamaha 01V, you probably have an ADA8000. It was a cheap and reasonably good way to get another 8 mic's into your 01V via ADAT. It was also found in many a studio that needed more mic inputs. For the 8200, they beefed it up with MIDAS preamps, 24-bit Cirrus Logic A/D converters and a new switched mode power supply for lower heat and longer life. It’s also now red. Of course, you also get 8 XLR outputs, and the ADAT I/O can be clocked independently if needed. The cost for all these upgrades? $349. Today's post is also brought to you by Elite Core Audio. Elite Core Audio features a premium USA built 16 channel personal monitor mixing system built for the rigors of the road. For Personal Mixing Systems, Snakes, and Cases, visit Elite Core Audio.